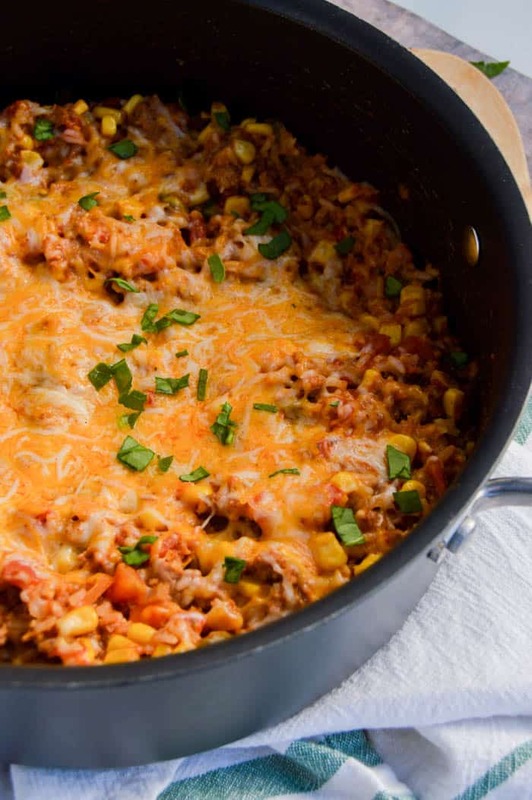 This Taco Casserole is all made in one pot and done in less than 30 minutes. With a few simple ingredients you dinner is ready and your family will eat this one up. This recipe is a favorite of mine. When you combine a taco casserole with a one pot meal and it’s all done in less than 30 minutes. I mean how could you not love this recipe. We topped ours off with sour cream and I added sliced jalapeños to mine. 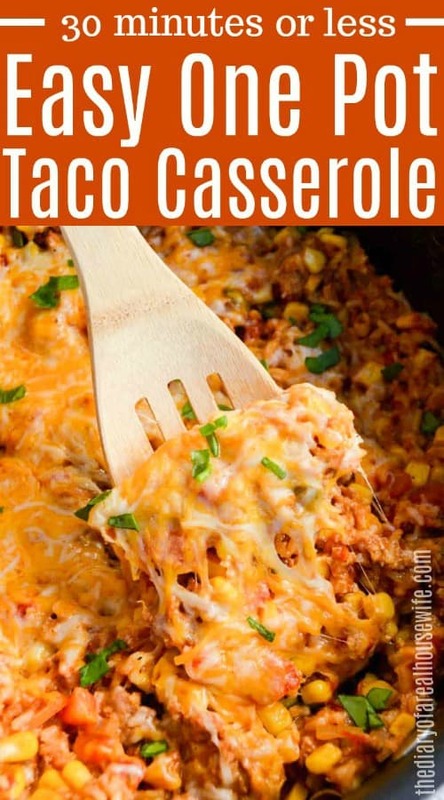 What rice should I use for this taco casserole? For this recipe, I used instant rice. It cooks much quicker and works perfectly for this recipe. Chicken Enchilada Casserole: Need a simple dinner recipe that is ready in less than 30 minutes, look no further. This Chicken Enchilada Casserole is simple to make and full of flavor. Chicken and Rice Casserole: This simple Chicken and Rice Casserole only takes a few ingredients and it bakes in 15 minutes or less. It’s creamy and cheese and a recipe that you are going to love. Pepperoni Pizza Casserole: 5 Ingredients and less than 30 minutes to make this Pepperoni Pizza Casserole is a recipe that you will love just as much as the kids do. It’s simple and easy and a real crowd pleaser. Warm a large pot on medium heat. Add diced onions and minced garlic. Allow to cook for 1-2 minutes then add in ground beef. Cook and crumble until fully cooked. Drain fat then cooking in taco seasoning, rice, corn, and Rotel. Mix together well then add in broth. Bring to a boil then reduce and allow to cook for 5 minutes. Remove from heat and add in 1 1/2 cup shredded cheese and mix well. Add remaining cheese to the top of the casserole and cover with a lid. Allow to set for 5 minutes for cheese to melt. Yum it’s only breakfast, but now I’m craving dinner! This looks amazing! Yummmm!! I also love replacing rice with quinoa too in these kind of dishes. Takes a little getting used to but we love it! Yes! YUM! I will be making this! Your little guy is getting so big – and cute! Oh yeah, how many servings does this make? Mmmmm! We love Mexican food. This looks super tasty (and easy)! This looks amazing, like every other recipe I see in here. Thanks for sharing! 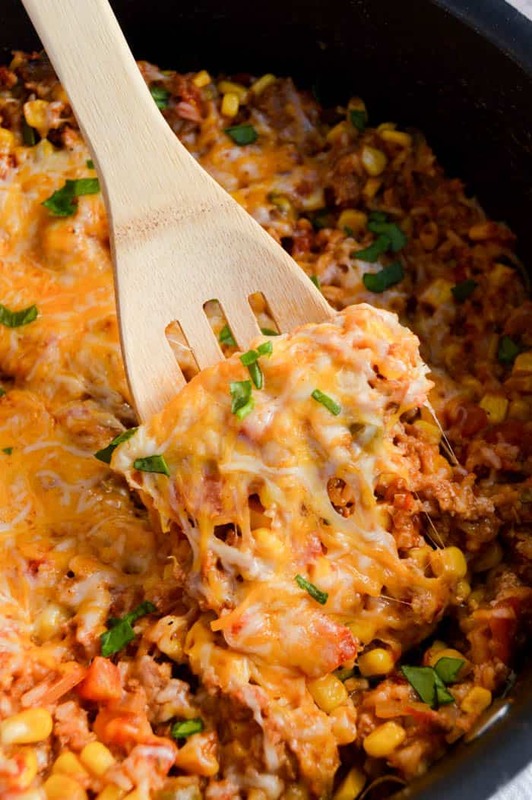 We are Mexican Food Lovers and we would just love your Taco Casserole, it looks delicious. Thank you so much for sharing with Full Plate Thursday and hope you are having a great week.